Zero Tool unit - batteries and charger sold separately. 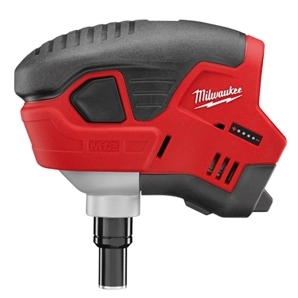 The Milwaukee C12PN-0 M12 Cordless Palm Nailer is a ideal tool for those jobs where the hassle and size of a air compressor or hose is just not possible, the built in LED job light and size of this machine is brilliant for working in confined spaces. This professional compact version of a nailer is capable of effectively driving 100mm framing nails in less than three seconds, the average run time drives up to 100x90mm nails in a single charge. The powerful impacting mechanism built into this tool makes it more than capable of completing the most difficult of tasks. This model runs of the new style M12 Milwaukee 12v Red Lithium batteries, they offer greater power at a fraction of the size of the older traditional NiCad/NiMH. They are built with a on-board fuel gauge so you are able to see exactly how much run time you have left on your battery.